Arizona Glass & Door Connection is one of the leaders at window and door service market. The quality of our services has been proven by years of working experience and hundreds of satisfied clients. We use only the top materials to manufacture the best windows, doors, glass tables, etc. to supply all your wants, we are always happy to answer all your questions and help you make reasoned choice. Arizona Glass & Door Connection always offers you the latest technologies and ideas to make your house safe, good-looking and comfortable. 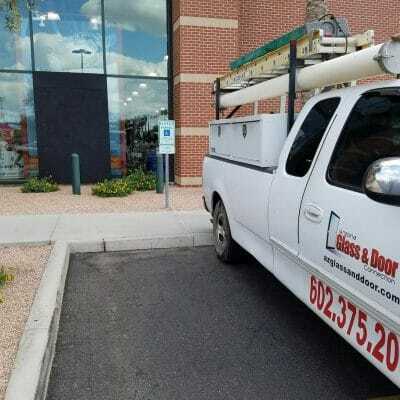 You have a number of reasons why choose Arizona Glass & Door Connection. If your house of office has suffered from burglars or vandals attack, or a natural disaster, Arizona Glass & Door Connection will not leave you alone with your trouble. Contact us, and our professionals will arrive at any time to help you in your situation – we will clean up the glass debris, board up your broken door or window. In some cases it may even be possible to replace or repair it straight away! We work with all types of windows and doors, so you can be sure you will not have to wait long to have your windows or doors back in their best condition. Yet sometimes it is not possible to repair the windows on spot, but we understand you cannot leave your home without protection. In these situations we can neatly board your window up for some time until we arrange the matter with the panes and frames. We ensure that your boarded up window will not give your house a look of neglected abandoned dwelling and, which is more important, you will feel safe and sound in your house until your new window is installed. Whenever a problem with your keys or door locks occurs to you, do not hesitate to call Arizona Glass & Door Connection. Our professionals are available 24/7 for any residential or commercial lock emergency, and you can be sure they will solve your problem without damaging or breaking your door or jambs. Our professionals can quickly fix any window problem you have, repair or replace your window or skylight always offering the best pricing and the highest quality. Needless to say that a good, strong door is an essential part of any house or office. Doors have many functions – they protect you and your property from robbery, contrary weather, street sound, and, of no little interest, the door creates the first impression on your visitors. Our company provides quick, quality service at really good prices. With our doors you can always be sure your house or office is safe and good looking. Contact us for any information required, and we will help you decide what exact door type or door service you need. Moreover, you can always rely on us if you need to get some scratches removed from your window or glass door. Screens are a very useful feature if you want to protect your house from insects, animals and debris getting inside yet not impeding the air ingress. We work with all the different types of screen doors (different shapes, materials and mount types) and window bug screens, including sun screen mesh. Also, Arizona Glass & Door Connection provides screen repair and replacement services in case your existing screen or screen door has got bent, ripped or damaged. Among other services, Arizona Glass & Door Connection is happy to offer you our handyman service. Unfortunately, vandalism is not a rare thing today, so if your house or office walls have suffered from unwanted street art, contact us immediately and our professionals will remove or cover it up at the earliest possible time. We are always happy to give you all the necessary information and help you chose the best variant considering your wishes and financial capacity.